My little 5 year old just starting going to preschool in January. She goes 3 days a week for 3 hours each day. It’s perfect. It’s not too long, it gives her enough time to play with friends, she has an animated and excited teacher (and teacher’s aide) who love her, and she is getting a great introduction to this whole “school” thing. Let me tell you, this girl adores preschool. She comes home telling me things that she has learned and figures since she has never heard me talk about certain things, that I must not know about them. Like fossils. And astronauts. And the pronunciation for certain words. And oh boy, if I try to correct her……….oooh, watch out. Whatever her teacher taught her, is complete doctrine. Nevermind that she may have misunderstood her teacher. She came home the other day and said, “mommy, you never even told me I had an-ull-gies!” I looked at her a little confused…….”huh? an-ull-gies?” She kind of stuttered through the word again as I realized she was trying to say allergies. “Oh, you mean allergies?” She quickly replied, “Yes, allergies! My teacher told me I have allergies.” I kinda laughed. “Oh, really? What did she say you are allergic to?” She explained that her teacher told her that since she was sneezing a lot that day and was feeling cold, that she must be allergic to the cold. I kinda laughed as I told her that she wasn’t actually allergic to the cold but her teacher must have just said that because she was feeling cold and was so sneeze-y ………but was probably kidding. She cut me off. And refused to believe anything different. She was officially allergic to the cold and there was no way I could unravel that diagnosis given by her teacher. Her teacher is all knowing, I guess. So yes, my little girl loves her preschool teacher. How can I blame her? This teacher knows all sorts of stuff that even mommies don’t know (i.e. fossils, astronauts, and allergies)……and she plans the best parties. Like Chocolate Milk parties and The Letter “K” parties and Valentine’s Day parties. Oh, this girl has been excited for her Valentine’s Day Party for weeks. So, of course, she needs Valentine’s cards to exchange with her other 10 classmates during their party. So we pulled out the same idea that we used last year, and made our own little sucker/picture Valentine’s Cards. The idea has saturated the crafting world (thank you to whoever thought it up a few years ago!) and there’s a reason. These little cards are quick and easy. And darn cute. Last year, we only passed them out to a few friends. This year, my little girl is excited to give a card to each of her classmates at preschool. Ah, the joy of Valentine’s Day. And because writing your name on your Valentine Card is half the fun…….she wrote her name and I transferred it digitally onto the picture. He can’t quite write his name yet, so I just used the writing tool and wrote it for him. Turns out, my handwriting with the Photoshop writing tool looks just like a 3 year old’s. So, it was perfect!! So, if you’re anything like me and have high hopes to hand-make Valentine’s cards…….but just ran out of time, no worries! I did too. So luckily, this doesn’t take much time at all. Just snap a quick picture and get them printed at a one-hour photo place. I uploaded my images to walgreens.com and then dropped by and picked them up when they were ready. Another thing is to get down on their level. The pictures definitely aren’t as cute if you’re above them shooting down. So crouch down. Now, if you have Photoshop and want to add your child’s name in their own writing, here’s what I did. (I knew there was no way that she could manipulate the computer mouse and write her name with the free-hand writing tool.) I asked my little girl to write her name on a piece of paper. Then I took a picture of it and uploaded it to my computer. Then I opened that image in Photoshop and then added another layer to my project. Then, I used my drawing tool (in white) and traced right over her name that she wrote. I tried to trace it as perfectly as I could, to keep all the charm of her 5 year old handwriting. Then, be sure that this layer is highlighted (the one that you traced in) and then “select all” and then “copy” this layer. Then I “pasted” the traced lettering onto my project that I was working on in Photoshop. Then I shrunk it down until it fit nicely. Perfect. Then I saved the picture and printed it right out at Walgreen’s. Like, 20 times. My little boy’s was mostly the same. Except, like I mentioned above, I just used the “pen” tool in Photoshop and wrote his name for him. Once the pictures were printed out, I used a utility knife to make slits above and below their fists and then slid the sucker stick right in. Simple. And fun. And seriously cute. Whew, Valentine’s Day is all taken care of! Any other really quick Valentine’s Card ideas that you’re using this year? Do share. They are really cute! We don’t really “do” valentines but they would make great party favours. In the UK, our babies start full time school at 4!! Officially it is the beginning of the term that they turn 5, but most local authorities now expect children to take up their school place from the September of the school year that they turn 5. The cut off date is August 31st, so if you have a summer baby, they have barely turned 4 before they start school! Luckily my eldest was 2 weeks late & born on September 1st, so just made it into the next school year. And I happen to be a Primary School teacher! I love that you included their Valentine’s shirts/dress you made. You have such a beautiful family! Thank you for sharing your photos and projects with us! It just makes my day everytime I discover a new post! OMG! These are sooo adorable!!! Very cute, I’ve seen these, and I think it’s very clever! I did this for my son’s kinderdarten class this year, but I took pictures of each child for them to personalize and give to their Valentine at home. They are so adorable and I can’t wait for the kids to see their pictures today. We did this too, for my daughter’s preschool class. I wrote “Happy Valentine’s Day” on a whiteboard, had her sign her name under it, then had her pose in front of the whiteboard with her fist out. Having to line up with the text, get her hand in the right place, and get the cute smile all at the same time probably made for a slightly longer photo shoot, but once I got it there was very little else to do. I really love how they turned out! Your kids are too adorable, Ashley. I really wanted my 4 year old to do the “sucker in the fist” or “sucker through the head”/Shot by Cupid Valentine’s but he insisted on Cars Valentines this year. However, my 1st grader was willing to do something more fun and we did glow stick lightsabers as he is a big Star Wars fan and has an Obi Wan costume. http://i968.photobucket.com/albums/ae168/Kreztes3/New2Album/NewAlbum3/DSC_0131.jpg I use the same trick as you to get his name onto the Valentines, and since I wanted it white I just did “invert” in Photoshop. You can also select around it with the marching ants and do a “cover overlay” in whatever color you want for your Valentine’s. Ashley these are too adorable. 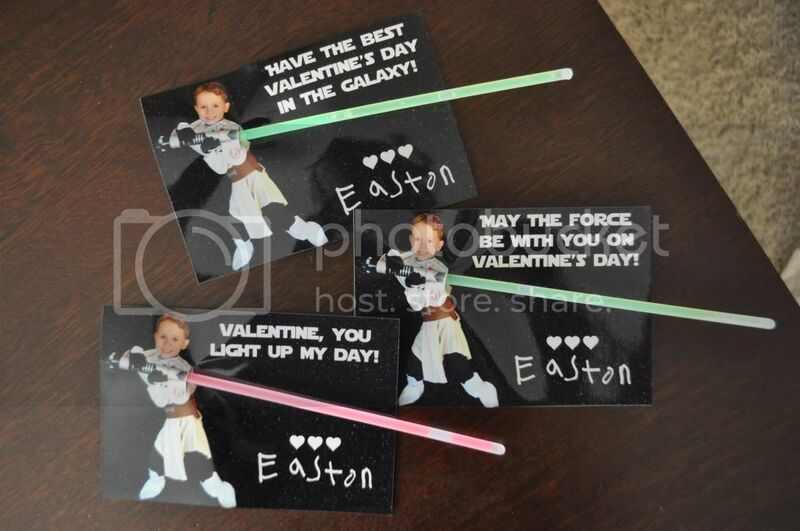 I had never seen them until you posted them, and since I had not bought my kids valentine’s yet…. I did these last minute, last night:) They turned out great. When I took them to my daughter’s school, the secretary just had to show everyone else. She even made a copy of it because she also wants to do them. I told them I didn’t come up with it:) One thing that I think will be super cute is for Mother’s Day, Grandparent’s Day, or just any ole thinkin about you day is…. make a flower out of tissue paper with a pipe cleaner stem and stick it through the hole. Or, you could always put a real flower in there, but I figure tissue flowers will last longer. LOL Thanks again for the idea!!!! Fun fact, I have a friend who actually IS allergic to cold… she can’t eat ice cream or anything. It’s crazy. I’d pass out happy if I got something that cute from such adorable kids. When I was kind, and learned that allergies prevent you from eating some stuff, I stubbornly claimed to my mother that I was allergic to spinach. These are super cute! These are the best sucker Valentine’s I seen. I love the personal aspect. Thanks for sharing. Love love love this! Thanks so much for the great idea!